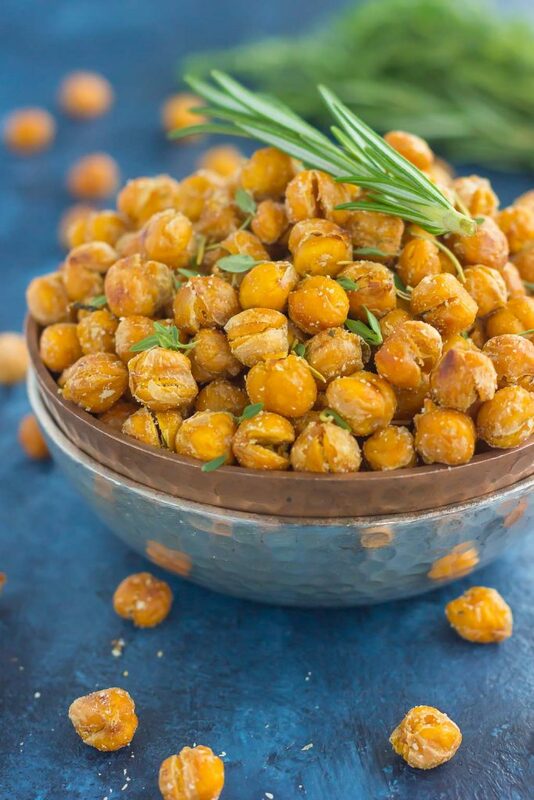 These Roasted Parmesan Herb Chickpeas are a healthy way to satisfy those snack cravings. 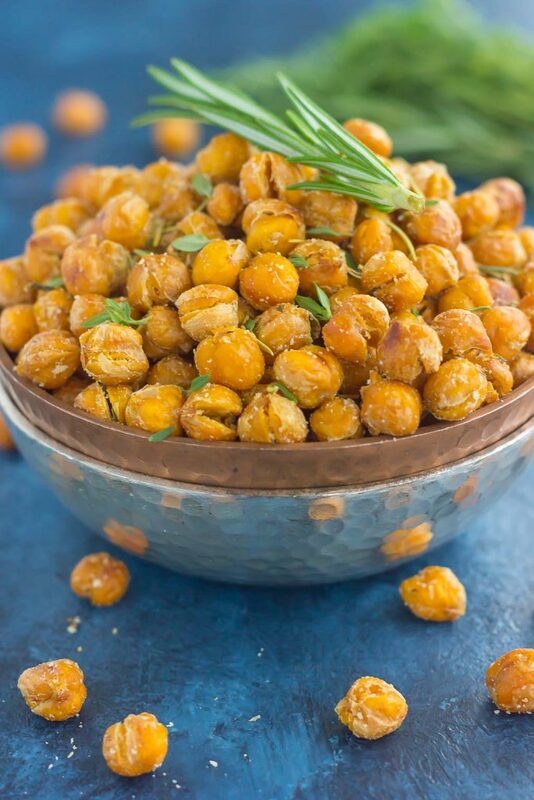 Filled with fresh rosemary, thyme, oregano and a sprinkling of Parmesan cheese, these crunchy chickpeas are full of flavor and irresistibly delicious! Sometimes you just need a little crunch to get you through the day. So tell me, are you team sweet or team salty? Or maybe you’re part of team sweet and salthy? I would classify myself as team salty all the way, though I do love a good sweet and salty combo when the mood strikes. Chips, pretzels, you know…anything with loads of salty, flavor-y, herb-y goodness get me every time. And the crunch. Because you gotta have the crunch! When I was little, I remember my dad used to love corn nuts. Have you had those before? I haven’t seen them in years, but I know corn nuts are still around. They’re basically crunchy corn kernels loaded with flavor. The taste is irresistible, and the crunch is…well, crunchy! I always knew when my dad was munching on them because of the sound. After I got to thinking about corn nuts, I decided to make the next best thing…roasted chickpeas! It still gives you the crunchy texture and flavor, but with the benefit of a garbanzo bean (aka chickpea). If you love these little guys like I do (have you tried this Quinoa and Chickpea Pesto Salad or this Smashed Chickpea and Avocado Sandwich?) then you’re in for a real treat with roasted chickpeas. 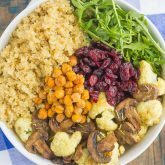 If you love regular chickpeas like I do (they’re a must in my salads! ), then you’ll love the roasted kind. The texture, the flavor, and the crunch…it’s so good! And healthier, too. When those cravings strike for potato chips or Doritos, these are the little guys to reach for. And the herbs…let’s talk about the fresh herbs! I’ve mentioned a time or two before that I love rosemary. There’s nothing quite like the smell or taste of fresh rosemary. And when it’s combined with some chickpeas, watch out! Flavor overload! And then there’s thyme. You can’t go wrong with fresh thyme either, or really, any fresh herbs. 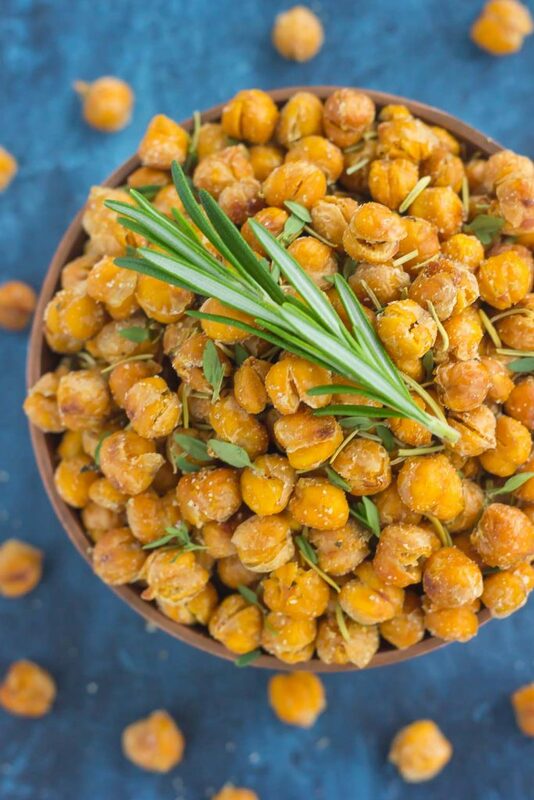 And that’s what makes these roasted chickpeas so special…the fresh and flavorful herbs. Like most of my recipes, these Roasted Parmesan Herb Chickpeas are a breeze to whip up! Simply drain and rinse some chickpeas and then pat them dry. Toss them in some olive oil and fresh herbs, and then let the oven work its magic. Once they’re crispy and golden, sprinkle on some Parmesan cheese and get ready to be wowed. Whether you eat them by the handful, toss them onto a salad, or stir them into some soup, I know you’ll love the hints of fresh herb and crunchiness of these Roasted Parmesan Herb Chickpeas! Looking for more easy snacks? I’ve got you covered! Heat oven to 425F. Line a large baking pan with parchment paper or lightly grease with non-stick cooking spray. Set aside. Using a colander, drain and rinse chickpeas. Spread them out on a counter or flat surface lined with paper towels and pat dry. I like to pat them dry several times and keep them on the counter for 10-15 minutes to dry. The drier your chickpeas, the crispier they will become when baked.I also like to remove some of the skins, as they will start to peel off when patted dry. But if you prefer to leave the skins on, they're just as good! Once chickpeas are dried to your liking, spread them out onto prepared pan. Drizzle with olive oil and sprinkle with rosemary, thyme, oregano, and salt. Toss to coat and spread in an even layer. Bake for 50-55 minutes, or until chickpeas are crispy and lightly browned. I like salty and sweet combos, but if I had to pick one it would be more on the salty side. I LOVE roasted chickpeas. Love 'em! I make them pretty regularly, but have never had with parm cheese before - what a great idea cause you know I love cheese :) And the fresh herbs are a perfect touch for flavour and aromatics. Having these on a salad is such a fantastic idea too - so much better than croutons! Pinned! Have a wonderful weekend, Gayle! I agree, team salty is the best! And you've got to try chickpeas with Parmesan, it's SO good! Thanks for the sweet comment, Dawn! So much better than corn nuts!!! 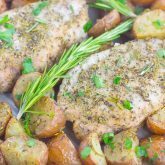 :) I also love the combo of Parmesan and rosemary, so these are calling my name! Delicious! Yes! I would take these chickpeas over corn nuts any day. Thanks, Blair! This is my kind of snack! Love the parmesan herb flavor! I am definitely Team Salty! But for some reason I've been craving ice cream like crazy, lately! Anticipating summer in a delicious way! ;) These crunchy chickpeas are the perfect crunch! Pinned! Ice cream is never a bad thing! :) Thanks, Annie! Sweet and salty snacks are the best but if I had to choose one, it would be team salty. 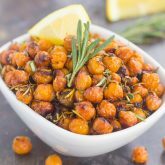 I adore roasted chickpeas and love all the fresh herbs in here! Such a fun and yummy snack! Thanks for the chickpea love, Kelly! Team salty ALL the way!! I totally remember corn nuts! I haven't had those in aaaaages though. 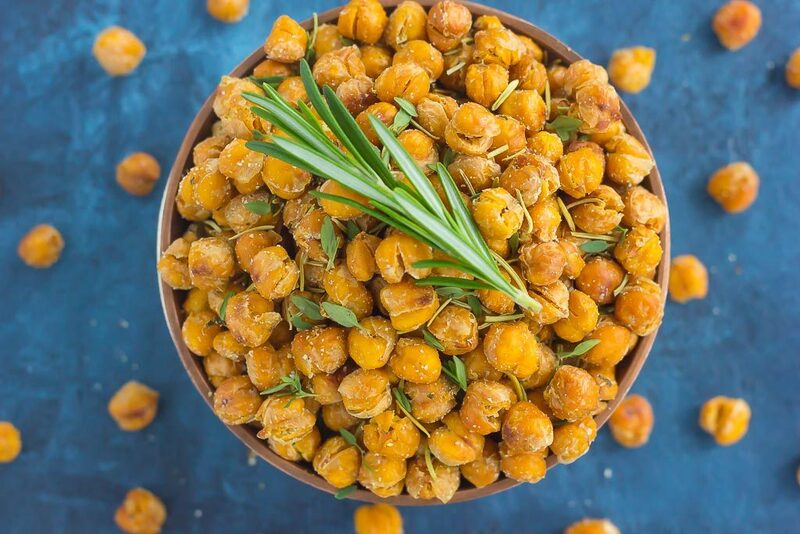 I'm a crispy chickpea addict, so you better bet I'm adding these to my snacking list! LOVE all the herbs with the parmesan! I could easily eat, like, 10 cups of these in one sitting. Possibly 14. :) Pinned! Cheers, dear! Haha 14 cups sounds doable! :) Thanks, Cheyanne! Haha all teams is definitely an option! Thanks so much for the chickpea love, Demeter! I would TOTALLY be eating these straight off the baking sheet until they were demolished! LOVE the Parmesan and herbs you packed into these beauties, Gayle! Do I have to pick a team??? haha Both please!! :) ANYWAY - I love chickpeas and these sound sooo good for a snack! Hope you've had a great week Gayle!! Team sweet AND salty wins then! :) Thanks, Ashley! I used to love Corn Nuts too! These roasted chickpeas are a way healthier, better replacement though. Love the parmesan and herbs you added - so tasty. I agree, roasted chickpeas definitely beat corn nuts! :) Thanks, Rachel! I don't like overly sweet, so I'd have to say I'm on team salty! This is the type of snack I love munching on at night so I don't feel too guilty. :) . I love all those fresh herbs and that parmesan. These look so addicting and delicious! Oh these look SO good! I expected more oil to be used with how crunchy they look but i'm impressed! May have to whip this up tonight :) mmmm, mmm. Thanks for the kind words and for stopping by, Hannah! Hope you love these if you try them! I'm making these today. Could you please tell me how to store these roasted chickpeas? Do they have to be refrigerated? If so, will they stay crunchy? Thanks! Hi Cindy! I store chickpeas in an airtight container on my counter. Mine usually last for up to two weeks. Hope you enjoy them and thanks for stopping by! Thanks so much, Gayle! They turned out great! Even my husband, who hates chickpeas, raved about them. We'll be making them again. I'm so glad you liked them, Cindy! These are one of my favorite, easy snacks. Thanks so much for letting me know how they turned out!